ROME, ITALY--(Marketwired - Dec 8, 2015) - Pope Francis may not wear the traditional papal red shoes, but he will be wearing a red hat this Christmas in Popemoji form. 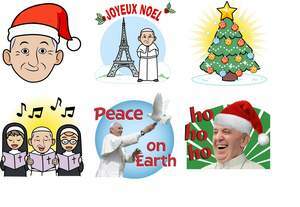 Today Aleteia.org announced the availability of its Christmas-themed Popemoji update just in time for the holidays. The initial Popemoji were designed to celebrate Pope Francis's visit to the U.S. last September and immediately became a hit around the world. As a result, the Popemoji app will soon be available in seven languages. The Christmas pack is being unveiled in conjunction with the lighting of the Vatican Christmas tree and launch of the Jubilee Year of Mercy. The Popemoji keyboard has added distinct seasonal options to the original custom emoji and GIFs of Pope Francis. The updated versions of the app are available for free at iTunes® http://apple.co/1QkqF2F and Google™ Play Store http://bit.ly/1Ljt6Do. The Popemoji conceived by Aleteia USA, Inc's digital agency Sports Media Challenge were produced by Swyft Media Inc., a wholly owned subsidiary of Monotype Imaging Holdings, Inc.
Twenty new Christmas Popemoji began rolling out this week. The fun loving new images showcase Pope Francis crooning Christmas carols with nuns; chuckling ho ho ho; wishing Joyeaux Noel to the French in front of the Eiffel Tower; breaking a Christmas cracker or bon-bon, Strumming a guitar to Feliz Navidad, sitting by the fire in an ugly Christmas sweater; and of course wishing all, "Peace On Earth." The Christmas-themed emoji will be added to the original pack of emoji and GIFS. "The success of the original Popemoji launch genuinely shocked us. Demand and engagement were veracious," said Jason Deal EVP Strategy & Marketing at Aleteia. "We felt like we owed it to those who keep downloading and using Popemoji to keep it fresh. A Christmas pack is the perfect opportunity to continue sharing the joy and hope of their Christian faith." According to Sports Media Challenge's Kathleen Hessert, "More than one million Popemoji have been sent around the world. Popemoji are now a legitimate part of pop culture including references on American network morning news and late night TV as well as media on all seven continents. Their appeal went well beyond the expected youthful crowd to include people as old as 90, many of whom didn't know the term or ever use, emoji." When asked what she thought the Pope would say on seeing his namesake Santa emoji Hessert said, "Ho ho ho." Emoji are ingrained in today's language, particularly among young people which make them a natural to engage the largest generation in the world, millennials. Through the charismatic appeal of Pope Francis, Popemoji can enable new and intriguing conversations between the Church and young people over the long term. "Brands and important public figures like the Pope continue to find that the best way to engage millennials and young consumers is to provide them with branded and shareable content that makes conversations with friends fun and entertaining," said Evan Wray, co-founder and vice president at Swyft Media. "The success of our first Popemoji campaign was impressive, with nearly 120,000 downloads of the keyboard and a million sends of the emoji. We're thrilled to have created a new set of holiday-themed Popemoji that will serve as a visual and conversational centerpiece at a high profile event like the lighting of the Christmas Tree at the Vatican." Aleteia USA, Inc is a New York-based Christian media company that develops digital media and innovations for Catholics worldwide, including Aleteia.org http://www.aleteia.org. Reaches over 5MM visitors globally per month in seven different languages.